✅ REJUVENATE AND RELAX YOURSELF - Indulge yourself by massaging your skin with our premium Jade Roller and Gua Sha Stone! Feel the stone's soothing surface glide across your face while restoring its complexion and revitalizing its natural shine while transforming it into a clean canvas that is free of acne. Immediately remove muscle tension as the roller smooths fine lines and eliminates wrinkles and gives your skin a healthy glow. So Make the right choice! 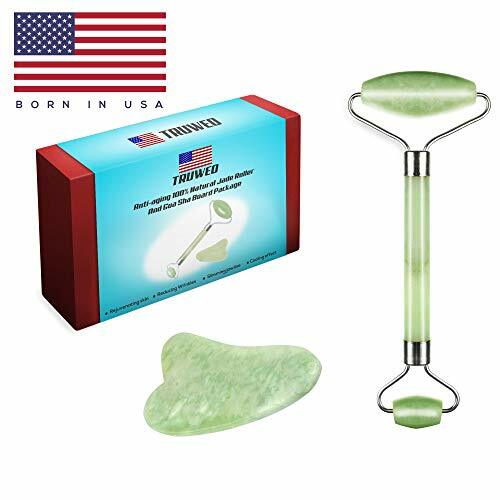 ✅ HIMALAYAN JADE JADE ROLLER & GUA SHA PACKAGE BY TRUWEO - The only Original & Premium quality Jade Stone Skincare kit made of 100% Natural Jade mined from the mountains of Himalaya & reinforced stainless steel holders for stronger holding & smoothly rolling. The package can be used to enhance anti-aging benefits & is safe and effective for all skin colors & types. Easy to use & gives you that smooth touch and does not squeak, the smaller roller for eye area, while larger one for neck & face. ✅ SAY GOODBYE TO PUFFINESS, WRINKLES AND FINE LINES - Using our anti-aging skin-care beauty toolkit as a part of your daily routine will help to relax your face and body that will reduce the dark circles, puffiness and promote blood circulation around the eye area with the roller & gua sha, and increases lymphatic drainage. After a few days, you'll notice some significant changes. It'll reduce puffiness in your face/eyes. Your face will be less puffy, feel less tense, look tighter and facelift. ✅ PERFECT BEAUTY GIFT WITH 100% SATISFACTION GUARANTEE - Our Jade Roller & Gua Bundle Package is a Top Quality self skincare tool which is perfecting for gifting at any occasion or keeping for yourself that will cool, tighten, and de-puff your face in seconds as it massages. No Reason Exchange, Replacement or Refund. The Best Customer Support | Our company culture is focused on Customer Care and Customer Experience. That's why we offer you 24/7/365 Support for any questions you might have. If you have any questions about this product by Truweo, contact us by completing and submitting the form below. If you are looking for a specif part number, please include it with your message. Kyoku for Men Eye Fuel, 0.7 fl. oz.